Interior fit-out for a gift shop and employee training lounge in the 14 Maple Avenue Office Building, which achieved LEED Gold Certification. 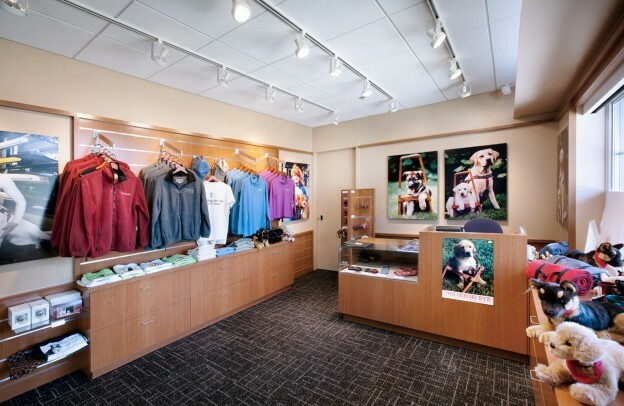 The non-profit organization utilizes the space to train guide dogs for the sight impaired and the storefront acts as a public face in the Town of Morristown. Custom-designed retail display components and graphic image branding in the Gift Shop. Custom carpet tile pattern in Lounge to create a “living room” feel for dog trainers and student dogs. Transitionally styled furnishings suitable for an environment with multiple dogs. Sustainable features include FSC-Certified wood veneers, low VOC paints, interior light shelves, Energy Star appliances and water smart plumbing fixtures. This entry was posted in Interior Design on October 23, 2014 by swolock.